Ascension materials grind wearing you down? 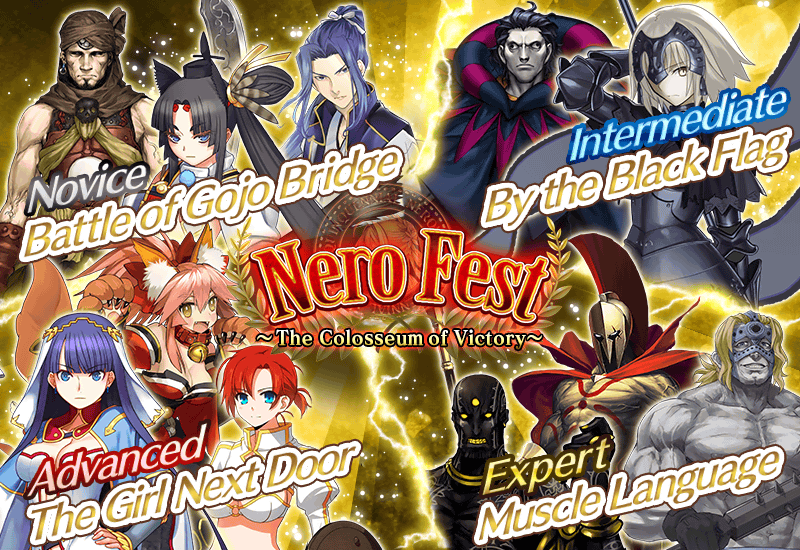 Fear not, NERO FEST is here! 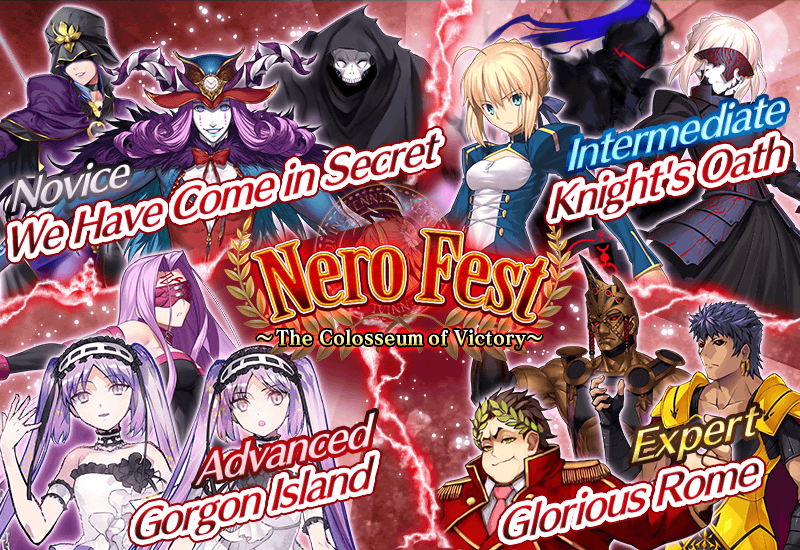 Hosted by the most umu Roman Emperor Nero Claudius, this 9 day event will challenge you. If you succeed, her majesty would shower you in ascension and skill up materials! Complete each event quest once for their guaranteed rewards. Collect bronze, silver, gold medals for exchange in the event shop. Event quests also drop ascension materials and the Craft Eseence Nightless Rose. Each stage starts at midnight Eastern, 9 PM Pacific. 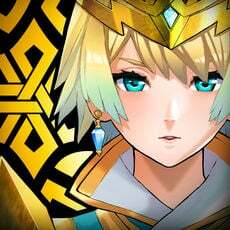 Drop rate research conducted by the Grand Order Subreddit. You'll want to spend most of your APs on the event quests during the event. Focus your efforts on buying out out the ascension materials your Servants need first. 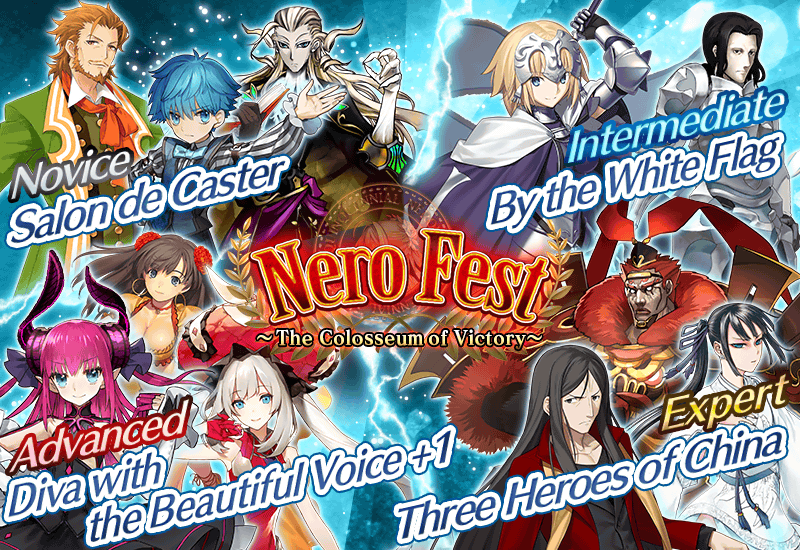 Of course, who to feature for limited event summoning but Nero and friends? 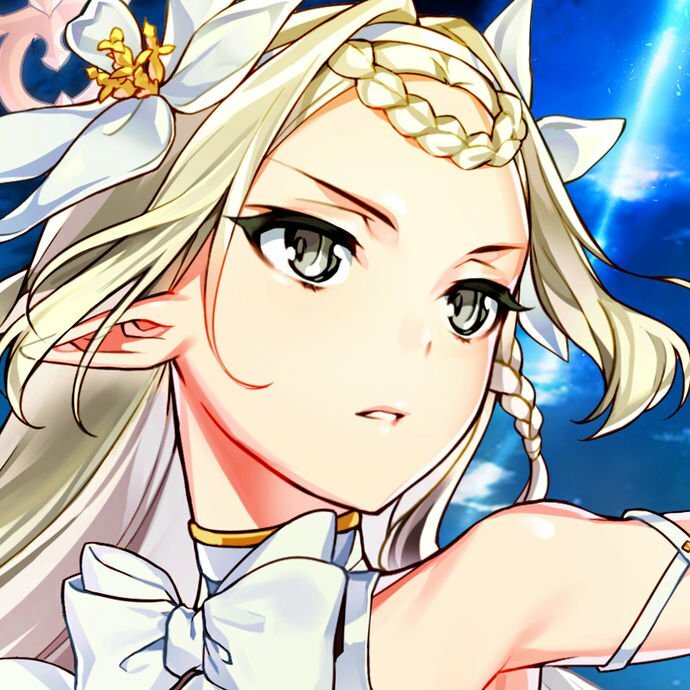 Nero Claudius will be made available to all players, regardless of story mode progression. 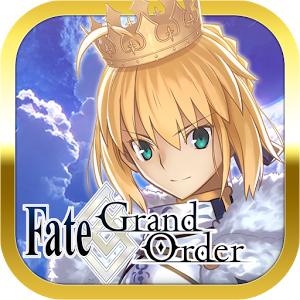 Give the Nero Banner a shot, If you're looking to add a strong Saber to your Servant lineup. Otherwise, consider saving your Saint Quartz and save for future events. Effect Apply Guts 1 time, revives with 500 HP. Limit Break Effect Apply Guts 1 time, revives with 1,000 HP. Gilgamesh: NP deals bonus attack against other Servants. Zhuge Liang: Always useful on every lineup. Strong Berserkers like Lancelot, Vlad III, Heracles, Tamamo Cat. Altria Pendragon, Altria Pendragon (Alter), or other high damaging area-of-effect servants. Jeanne d'Arc: for fights you cannot otherwise win. Of course, level up your main lineup. If you have the numbers for it, put together a Buster-focused Berserker team. Their powerful Buster-chains are devastating in this event. Ushiwakamaru: Excellent against Zhuge Liang in the Prelims - Expert stage. Robin Hood: Powerful single target NP against the many Saber opponents in this tournament. Hans Christian Andersen: Great support unit for long fights. Cu Chulainn: Your last line of defense with cockroach-like ability to cheat death, especially after first ascension. Make sure you have full AP going in to the starting time, and consider overflowing by planning a Master level up as the event approaches. In order to get all the Gold Medals necessary to buy out the Event Shop, you'll need to play multiple times a day to avoid wasting AP. This event is a marathon, so rest well and pace yourself. 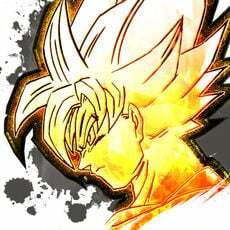 You'll need 200 Bronze and 100 Silver Medals for event shop ascension materials. 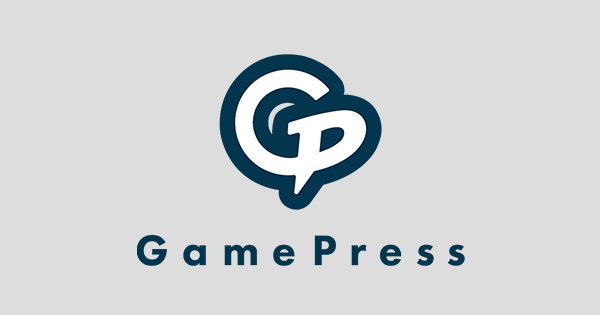 For that, you'll need to spend some APs on a novice quest. Check the drop tables below and decide which stage has the drop you value the most, and plan accordingly. If you need more Talons, grind Expert. Focus fire on Zhuge Liang first. Otherwise, grind Advanced for Gold Medals. If you need Seeds or Plumes, grind Advanced. If you need Crystals, grind Expert. Use a Altria Pendragon (Alter) support for quick work of last wave. Beat each stage once. 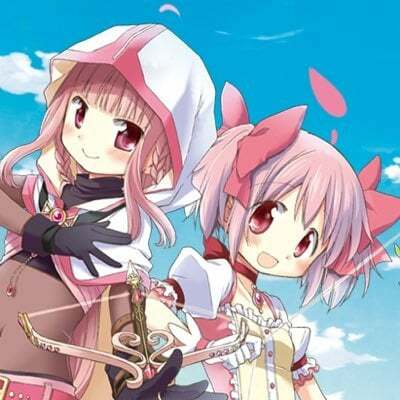 Use class affinities to your advantage: Riders beat Casters, Archers beat Sabers. Grind each stage as needed for shop purchases, apply gold apples as needed. Altria Pendragon (Alter), or any non-Berserker aoe servant, can make quick work of the Berserkers in Expert stage. As every class is represented in this fight, consider a Berserker line-up for abusing Buster Chains. A Lancelot or Tamamo Cat support with Kaleidoscope is excellent here and can quickly shorten the second wave. If not available, focus fire on Cu Chulainn (Prototype) first. If you run into trouble, don't forget about your Command Seals (top-right of battle screen). Worse comes to worst, use Jeanne d'Arc support and grind out a tough victory.